Did you think this day would ever come?? Don't look too closely: you'll see that I need to majorly touch up paint, the sink on the right has a hole in it, the baseboards need to be caulked and painted, but it's a hundred gajillion times better than it was before and I went a whole week without breaking anything. I promise I'll give you more close-ups, details, tutorials, etc. this week, but I told you I would have a surprise today, so here she is. 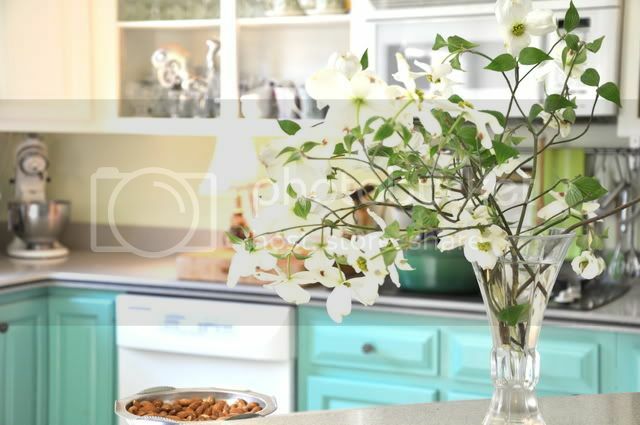 Since we're talking makeovers, If you haven't seen Edie's Retro Cottage Kitchen Transformation, it is a must see~absolutely amazing. Wow! This bathroom has come a long way. It is beautiful. It belongs in a magazine! Beautiful work. WOW! I think my jaw dropped and my eyebrows went up-when I scrolled down to the "after"! :)Great job! What a difference! It looks fantastic! Hooray! It is beautiful! You remember TRANSFORMER--"More than meets the eye!" well that is you!! Love it~love you! Wow, the bathroom looks incredible! I can't wait to see more close ups and hear about the details. Absolutely amazing transformation! Looks gorgeous! That bathroom is beautiful great job. It does belong in a magazine. What color is that called? Gorgeous makeover. 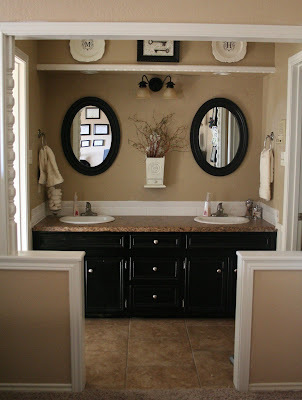 I did black cabinets in my master bath also with black mirrors above as well and love the look. BRAVO, great job. I'm in awe - it looks gorgeous. You did an awesome job! Well I have to say that it was worth the wait. Totally amazing. I love every detail, it is just fabulous!!! oh what a transformation! This is gorgeous! What is that planter in between the mirrors? I love it! Oh my gosh! All I can say is: AMAZING! That is an awesome transformation! Thanks for the inspiration! Looks great! You do such a great job with all of your makeovers! Wow, Melissa! You guys really did a GREAT job! Yes, I want to hear all the details!! Unbelievable! I totally love it. Totally. The reveal was worth the wait! You did a b-e-a-u-t-i-f-u-l job!! I am anxiously awaiting more pics. Melissa!! Holy Cow!! Girl that is Awesome! Thanks for sharing your amazing transformation. Wow! I'd say that is a huge difference! It looks great! Wow, that looks absolutely amazing! I would never guess that it was the same bathroom. Great job! Fabulous makeover!! It beautiful, Melissa! You did an absolutely gorgeous job with your bathroom! It looks fabulous!!! Even though it is not perfect. Congrats on not breaking anything for a week. I love where you have put your plates. Great job! Looks soooooo much better!!! Super cute! oh my goodness-it looks so great! so serene-great job!!!! especially love that shelf area above the mirrors! Wow! That inspires me to start my master bath redo. This a great transformation and I know you are proud of it. My motto is "people who look too closely and criticize are not invited back"!!! :) Your hard work has certainly paid off! I'm speechless. It. Is. Stunning. That's a GREAT transformation!!!! Congrats! No words! Too unbelievable! OK I guess gorgeous might describe it. I am inspired by your make over. Wow! so lovely, Can you come help me with my house as soon as I move? That would be fantastic. You should be so proud! It's just beautiful!!! The bathroom came out beautiful. There is always the finish work that needs to be done. Great job! It's beautiful!!! I love the black cabinets. I have been thinking about doing that to my kitchen. Wow. My jaw actually dropped. It's so classy and inspiring, and I love your keys and monogrammed plates -- they're a perfect addition. Wow, wow, wow! I literally said "Oh my gosh" outloud when I saw your transformation. Then little ears came running and said "What is it mom?" So, we're all enjoying your makeover. Thank you so much for linking with me today. I love your blog and visit often. You have great style. Fantastic!!! So was that sink a NEW one?? Oh, I could cry for you. This is just beautiful! Can't wait to see more. Ok, silly me that is not a shelf. Its with wall with trim on it. Girlfriend...you really out did yourself this time. That.Is.Absolutely Beautiful. Seriously, one of the BEST before and afters I've ever seen!!! I love every single thing about it. That is completely stunning! I can't believe how beautiful it is! You are a VERY talented lady! Holy Moly lady! I love it! I see those cute "M" plates! :) Looks amazing, nice work! WOw--great job!!! What a beautiful bathroom!!!! B-E-A-U-T-I-F-U-L! What a transformation! I love your black cabinets...it's something I want to do in my bathroom too. I cant wait till we can redo our bathroom. We have old brownish/pinkish/orangish & white tile halfway up the wall, its so ugly. And the mosiac tile on the floor is shades of brown. 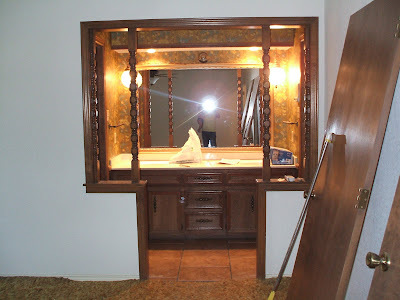 The vanity is huge and ugly, and the white formica with gold flakes counter is BAD. The cast iron tub has seen much better days. We gave it a slight makover (new paint, new ceiling light, new doors) but it needs a redo. You did an awesome job. Looks like something out of a magazine.So calming. Melissa...this is amazing! I'm speechless...beautiful transformation! GORGEOUS!! what an amazing transformation. Great job. Simply WOW!! That was the ugliest before I've seen in a long time...........you did a fantastic job on the re-do!! you totally rocked that out-of-date bathroom ! i love your new bathroom's simplicity. Wow what a completely wonderful remodel!! It sure updated it from that other era it was in, way to go, I love this!! That makeover is spectacular! It is no wonder you have been so busy. By the way, I loved Edie's too. Truly amazing transformation! Thanks for sharing...I feel motivated to update my bathroom counters! Oh WOW that is BEAUTIFUL! I think I actually said WOW outloud as I scrolled to the after!!! GREAT job! - now you want to come to my house? OH MY GOODNESS!!!!! That's an amazing job! you should be so proud! ABSOLUTELY Beautiful!!!! Amazing transformation! Looks so serene & inviting! I love that you put 2 framed mirrors above the sinks instead of keeping the big single mirror. Also love the black painted cabinets and the paint color you used on the walls! 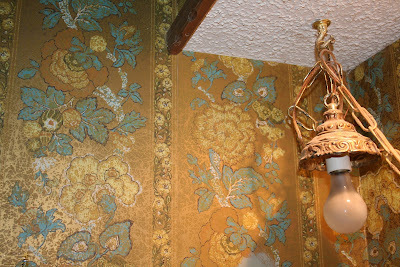 That had to be the most hideous before...I cannot imagine having to live with that! Your after is absolutely breathtaking! Gorgeous! Oh, that is one fantastic bathroom makeover! Love every single thing & boy, did you bring it out of it's dated self. This is AMAZING and 100% inspiring. Melissa - amazing job! I love it. What a wonderful transformation!!! Your bathroom is gorgeous!! 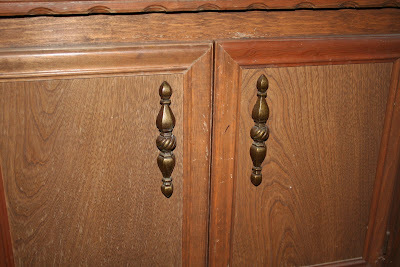 Did you paint over laminet cabinets or were those wood? I couldn't quite tell, i have some laminet peices that im either throwing out or painting but i don't know how to do it without ruining it...anyway, great job on the bathroom! GORGEOUS!!!!!!!!!!!!!!!!!! That is all that needs to be said! Amazing Transformation! How did you manage to get up every morning at look at that hideous bathroom!?! I would have hide every day and not wanting to accept the truth that that area is MINE! Your new bathroom is so great,warm and welcoming!! Again good job! Wow. I think that about sums it up! Oh, and FABULOUS! AMAZING! I will for sure be back to find out how you did. And all in a week?! I'm an totally impressed. AMAZING! I can hardly believe it's the same place. From previous pictures of your house, I thought that you lived in a newly built home. Obviously not. Great job! I am totally stunned and amazed. I hope you sent in your audition tape to Design Star, girl. This is fabulous. I'm a new follower. 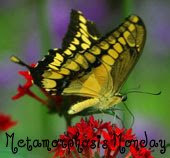 Please visit my blog and post one of your wonderful projects on my boardwalk bragfest. I'm going to be bragging about this for a long time. In the meantime, I'm adding this project to my to do list, as well. I had that same bathroom in my first home. Instyle at the time. friends do to make a space better.